THE Edge Media Group and partners are celebrating Corporate Malaysia’s best-performing companies and top responsible organisations at The Edge Billion Ringgit Club (BRC) gala dinner for the ninth straight year. “We look forward to celebrating Corporate Malaysia’s crème de la crème in the various categories on Sept 24,” says Ho Kay Tat, The Edge Media Group publisher and group CEO. OCBC Bank (M) Bhd returns as the main sponsor. Swiss luxury watchmaker Jaeger-LeCoultre is a supporting sponsor while Mercedes-Benz Malaysia is the official car. “I thank OCBC, Jaeger-LeCoultre and Mercedes-Benz for their strong and continuous support of BRC. This prestigious corporate awards event would not be what it is today without these excellent partners,” Ho says. Banking giant OCBC — the main sponsor since the event’s inception in 2010 and one of the world’s most highly rated banks — is a huge believer in sustainability and going the extra mile to attain excellence. “There has never been a better time than now to build in sustainability and corporate responsibility measures that go well beyond the minimum standards and existing best practices of the industry,” says Jeffrey Teoh, OCBC Bank (M) Bhd senior vice-president and head of corporate and commercial banking. “With a renewed sense of hope and purpose in the air and the reverberating call to be better than we ever have been, The Edge Billion Ringgit Club has matured over these nine years to become Corporate Malaysia’s conscience for a stronger posture of self-regulation. This is particularly so in those areas that do not tangibly generate revenue. We look to every member of this club to continue to make its own growth in sustainability and corporate responsibility a measure of success, so we will indeed be riding the crest of the welcome wave we find ourselves on,” says Teoh. Jaeger-LeCoultre is another strong believer in excellence and strong leadership, as reflected in the master watchmaker’s passion, vast heritage and constant quest for technical perfection. “This is Jaeger-LeCoultre’s fourth consecutive year of partnership with The Edge Billion Ringgit Club. We are extremely proud to be part of this programme because we believe in fuelling Malaysia’s drive for a greater entrepreneurial spirit, innovation and leadership, as this is the best way to bring about economic growth and community development,” says Maxence Kinget, Jaeger-LeCoultre managing director of Southeast Asia and Oceania. “This programme also reminds us of our founding fathers — self-taught watchmaker and brilliant inventor Antoine LeCoultre and the savvy businessman Edmond Jaeger. Today, we owe it to them for embracing the spirit of innovation and entrepreneurship that led to a thriving global business that employs thousands of people across the world,” Kinget says. The BRC Value Creator: Outstanding CEO of Malaysia 2018 will receive the Master Ultra-Thin Perpetual in white gold (RM128,000) timepiece, courtesy of Jaeger-LeCoultre. Just as producing ultra-thin calibres represents a major technical challenge in watchmaking, which is all the more daunting when movements comprise additional complications, the successful result befits a leader in these challenging times. 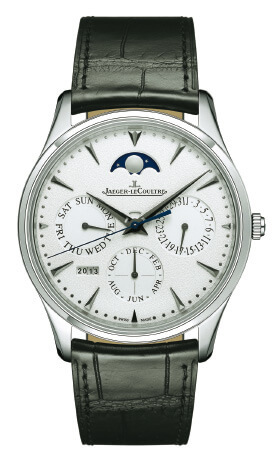 Jaeger-LeCoultre fulfilled a long-cherished dream of brand aficionados by unveiling its first ultra-thin automatic perpetual calendar watch. A single glance is enough to confirm the new Master Ultra Thin Perpetual’s prestigious lineage. Its understated beauty is a magnet for devotees and connoisseurs. The clear and self-evident layout avoids any risk of confusion — mirroring the mark of clear direction in a leader. Also returning as sponsor is Mercedes-Benz Malaysia, whose steadfast pursuit of excellence has been duly recognised with multiple prestigious awards. These include a triple victory at the Motor Klassik Awards 2018, where the Mercedes-Benz 300 SL “Gullwing” (W 198) was again chosen as the most sought-after classic car (1940s and 1950s category) while the G-Class of model series 463 was named the most promising classic vehicle of the future among current 2018 SUV and off-road vehicles. “It is our honour to once again be a part of the The Edge Billion Ringgit Club, highlighting outstanding corporate success and best business practices. At Mercedes-Benz, we are committed to placing the customer at the centre of our activities — a holistic strategy we believe is characteristic of BRC member organisations. The spirit of competition defines us, as it does this elite group, as we strive for continual improvement of ourselves, our companies and our respective industries,” says Mark Raine, vice-president of sales and marketing at Mercedes-Benz Malaysia. The Edge BRC recognises excellence in companies with a market capitalisation of above RM1 billion. The billion-ringgit cut-off serves as an aspirational target for dynamic smaller companies. Companies are added to the annual list automatically at the cut-off date (March 31) and are evaluated on growth in profit, returns to shareholders and corporate responsibility (CR) commitments, among others. Awards to be given out include Value Creator: Malaysia’s Outstanding CEO; The Edge BRC Most Profitable Company; The Edge BRC Highest Profit Growth Company; The Edge BRC Best Performing Stock; The Edge BRC Best CR Initiatives; and the coveted The Edge BRC Company of the Year. Previous Company of the Year winners are AirAsia Bhd, Nestlé (M) Bhd, Tenaga Nasional Bhd, Dutch Lady Milk Industries Bhd, DiGi.Com Bhd, Genting Bhd, QL Resources Bhd and Supermax Corp Bhd. Past winners of the Value Creator: Malaysia’s Outstanding CEO award include Public Bank Group chairman Tan Sri Teh Hong Piow, CIMB group chairman Datuk Seri Nazir Razak, AMMB Holdings Bhd chairman Tan Sri Azman Hashim, AirAsia group CEO Tan Sri Tony Fernandes, former S P Setia Bhd president and CEO Tan Sri Liew Kee Sin, former Malayan Banking Bhd president and CEO Tan Sri Abdul Wahid Omar, Axiata Group Bhd president and group CEO Tan Sri Jamaludin Ibrahim, Sunway Group chairman Tan Sri Jeffrey Cheah, Khazanah Nasional Bhd managing director Tan Sri Azman Mokhtar and Westports Holdings Bhd executive chairman Tan Sri G Gnanalingam. Other than Bursa Malaysia-defined industry peers, BRC members are also ranked against companies with similar market capitalisation with the creation of the Super Big Cap (companies with more than RM40 billion market capitalisation) and Big Cap (companies with RM10 billion to RM40 billion market capitalisation).